How Far is Sais Spectra? 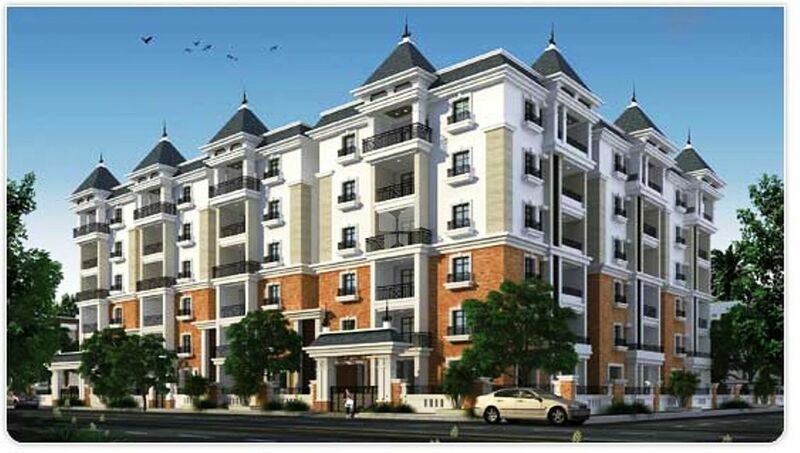 Rishis Sai Ram Projects Pvt Ltd has launched yet another project in Hyderabad Sai Spectra is located in Czech Colony. Red clay brick work in cement mortar. Internal : Double coat cement plastering finished with luppam. External : Double coat cement plastering. shutter finished with melamine matt polish fixed with good quality hardware. Internal Doors : Good quality teak wood frame and design flush shutter fixed with good quality hardware. UPVC single glazed tinted glass sliding door with bucks shutter standard hardware. Internal : Two coats of plastic emulsion paint over a base coat of primer. External : Premium quality texture painting. Common Area : Oil bound distemper. Dining, Living : Vitrified tiles of size 2 ft x 2 ft.
Bedrooms : Vitrified tiles of size 2 ft x 2 ft. Kitchen : Vitrified tiles of size 2 ft x 2 ft. Toilets : Best quality acid resistant, anti skid designer tiles. Toilets : Best quality acid resistant body designer glazed ceramic tile dado upto 6’-6”. Kitchen : Granite tile dado up to 2’ height above kitchen platform. Utility / Wash : Glazed ceramic tiles dado upto 2’-6” height. Granite platform with steel sink with bore & municipal water connection, provision for cabinets and exhaust fan. a) Medium size washbasin make Parryware / Cera. b) E.W.C in master bedroom with flush tank Parryware make. c) I.W.C for other toilet with flush tank Cera make. d) Hot and cold wall mixer with shower provision for geyser in all bathrooms. e) All fixers are C.P. coated best quality standard branded make. a) Concealed copper wiring of standard make. b) Power outlets for A/C & geyser in master bedroom. c) Power plug outlets for cooking range chimney, refrigerator, micro oven, mixer grinder in kitchen. d) Plug points for TV & audio systems. e) 3-Phase supply for each unit and individual meter boards. f) Miniature circuit breakers (MCB) & ELCB for each distribution board. Provision for master bedroom and drawing / living room. DG backup for common areas and limited points for flat. Water Connection as per municipal norms. Standard make V3F technology lift with 6 passangers of standard make. lift. RISHI’S SAI RAM PROJECTS PVT. LTD. is founded on a vision which seeks to usher in a better future by providing people with improved quality of life and living standards. Recognizing the basic need to approach the issue of planned development and growth across the residential as well as commercial segments of the Real Estate Industry. RISHI’S SAI RAM PROJECTS PVT. LTD. is well known for high quality. Whatever be the budget, we only use the best quality building material and equipment. We combine Aesthetics with Economics and Utility with Uniqueness. We have the dedication to do justice to your investment and the vision to make your dream come true. With over 15 years of experience in construction field, RISHI’S SAI RAM PROJECTS PVT. LTD. is a name synonymous with standards, ethics and values. It has the distinction of developing Residential as well as Commercial projects that are on par with the best in Industry. RISHI’S SAI RAM PROJECTS PVT. LTD. targets at being the leading property developer which aims to create landmark construction projects on par with high standards with specialized engineering , architectural skills and strong business acumen . We believe in building on strong foundations and this applied to our business as well. We put more into planning, design and construction than most other builders, so that our customers can have a home that delivers lasting value. We promise for excellence in everything we do to meet our customer needs. The quality of resources and the support that goes into every phase of our construction to build perfect homes is the highest in the industry. We have a tradition of excellence. We welcome the responsibility of providing complete satisfaction by building exclusive Luxury apartment for the best price in the market. While achieving the goals we also aims at becoming a preferred employer to its employees in addition to being the most preferred business partner to its associates and customers. A dedicated site supervision and high regard for punctuality mean that buyers and investors are never kept awaiting for their property. We feel proud that we deliver the project on time. We are committed to achieve and sustain growth by delivering projects and services of consistently great quality through efficient and effective operations.